At the Rural Housing Development Ceremony last week, ‘Meadow Haze’ in Woodbury was awarded runner-up Best Rural Housing Development Award. The judges were impressed by the way the development blended in with the village vernacular and had a number of “well thought out environmental features inside and outside to increase sustainability for residents”. They were particularly interested in the Rent-to-Buy tenure which helps tenants buy their home after a period of renting. The Rentplus model gifts tenants a 10% deposit at the point of purchase and the rent is set at 80% of market rent to allow tenants to save towards a mortgage. 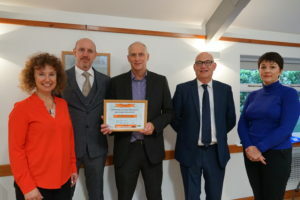 Present to accept the award were Rick Williams (Chief Executive of Cornerstone), Richard Connolly and Gareth Fitzpatrick (for Rentplus), Sharon Hewitt (For Cavanna Homes) and Anne Seaborne (for Cornerstone). Afterwards Anne said “Cornerstone is delighted to have been involved in delivering new, high quality, affordable housing in the Parish of Woodbury”. The next Rentplus scheme that Cornerstone will be project managing is at ‘Saxon Fields’ in Cullompton. Five brand new 3 bedroom houses will be marketed for rent-to-buy on this website in the New Year. L-R Anne, Gareth, Rick, Richard & Sharon at Thorverton Village Hall receiving the award.